A special thanks to Al Simms for the map. This map is on Al's web site and he was kind enough to let me use it as well. Al was in the Radar section of the 1-14th in 1967-1968. 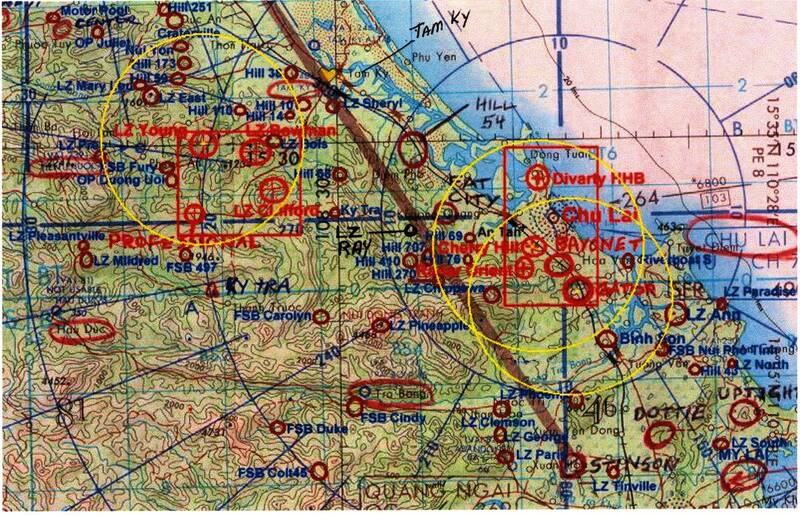 If you look just south of Chu Lai you will see LZ Bayonet the first LZ that I was on. Looking up and to the left along highway 1 you will see LZ Fat City.Continue north and you will see Hill 54. Keep going north and just above LZ Sherly you will see Tam Ky. Now go south and you will see LZ Bowman. From there go south and to the left and you will see LZ Professional. Now if you go back to LZ Bayonet and go south almost to the bottom of the map you will see LZ Stinson which was named LZ Buff when I was on it. LZ Ray as we called it was located some where to the left of Hill 69. I didn't know that LZ Bowman and LZ Stinson were so far apart. For that matter I never thought that I ever went south of LZ Bayonet while I was in country. Like I said before every where we went we went by chinook. The gun grews never had any maps so we really didn't know where we were. At this moment in time I don't know exactly where Charlie Battery went after I came home.